Half of Be The Momentum, Emily Allard, is hosting an inaugural clinic in her new hometown of Louisville, Kentucky. Hosted at Bellarmine University on Sunday, February 17th, slappers of all ages are encouraged to attend and learn from the former Chicago Bandit in this 90-minute, all-encompassing slapping clinic. The skills covered will be footwork, tee work, bunting, soft slap, hard slap and situational slapping. Emily is looking forward to working with you! 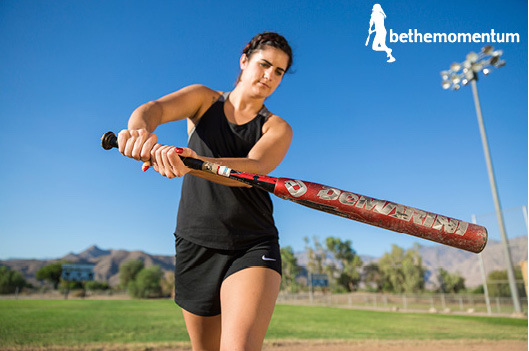 Half of Be The Momentum, Emily Allard, is heading back to Batter Up Training in Bloomington, IL for a skills clinic on Saturday, February 9, 2019. ALL sessions will be capped to ensure a low player-to-coach ratio. Players who sign up for all 3 sessions will receive 10% off. Half of Be The Momentum, Emily Allard, is teaming up with current Chicago Bandit, Sammy Marshall, to bring you a slapping, hitting and defensive clinic at Diamond Edge Academy on Sunday, November 18th. Players who sign up for 2 sessions will receive a $10 discount; 3 sessions - $25 discount. Be The Momentum is headed to Rainier, Oregon for the first time ever in conjunction with Lower Columbia Devastation! On Sunday, October 14, BTM will host its signature Slapper Boot Camp for both beginners and advanced slappers (focusing on fundamentals, speed/agility and mental training) as well as a defensive session for infielders and outfielders of all ages. Be The Momentum is headed back to Mount Ephraim, New Jersey! On Sunday, October 7, in conjunction with Pitbulls Fastpitch Organization, BTM will host its signature Slapper Boot Camp, focusing on fundamentals, speed/agility and mental training, as well as a defensive session for infielders and outfielders. Half of Be The Momentum and former pro player, Emily Allard, is returning to The Dugout in Northbrook, IL on Sunday, August 19th, 2018 for a one-day skills clinic. Be The Momentum is headed to Mount Ephraim, New Jersey! On Sunday, May 20, in conjunction with Pitbulls Fastpitch Organization, BTM will host its signature Slapper Boot Camp, focusing on fundamentals, speed/agility and mental training. Half of Be The Momentum, Emily Allard, will be heading to Northbrook, IL on May 5th for a skills clinic at The Dugout. Focusing on fundamentals and an appreciation for the opportunity to play, Emily will host both defensive and hitting/slapping sessions. *Sessions will be capped and those who sign up for both will receive $10 off their order. Be The Momentum is headed to Pella, IA! On Sunday, March 4, BTM will host its signature Slapper Boot Camp, focusing on fundamentals, speed/agility and mental training, in addition to a defensive session for infielders and outfielders. Be The Momentum is headed to Kenosha, WI! On Saturday, Feb. 17, BTM will host its signature Slapper Boot Camp, focusing on fundamentals, speed/agility and mental training, in addition to a defensive session for infielders and outfielders. Be The Momentum is headed to Milwaukee, WI! On Sunday, Oct. 8, BTM will host its signature Slapper Boot Camp, focusing on fundamentals, speed/agility and mental training. Half of Be The Momentum, pro player Emily Allard, will head to Des Moines, Iowa on Sunday, Feb. 19th for a Slapper Boot Camp and defensive session. Hosted by PGF Heartland and Iowa Premier Fastpitch, the clinic will be held at the team's Churchill training facility. 10AM - 1PM Slapper Boot Camp ($150) -- SOLD OUT! Be The Momentum is headed back to Eagan, Minnesota where its first-ever clinic was held! On Sunday, February 12th, BTM will host their Slapper Boot Camp at Strike Zone Sports, focusing on fundamentals, speed/agility and mental training. Be The Momentum is headed back to Cleveland, TN for a one-day clinic, hosted by Lee University, on Saturday, Jan. 28th. Emily Allard and Kristin Scharkey will offer their Slapper Boot Camp focusing on fundamentals, speed/agility and mental training, along with a defensive session for both infielders and outfielders. Chicago Bandits Outfielder, Emily Allard of Be The Momentum, is headed to Bloomington, IL for a ONE-DAY clinic on November 12, 2016! Emily's looking forward to working with you! Be The Momentum is headed to Fairfield, New Jersey for a TWO-DAY clinic on September 10-11, 2016! Highlighted by our first-ever Slapper Boot Camp, this exclusive opportunity will be offered on both Saturday and Sunday. The entire weekend will include four sessions of skill work. We're headed to Florida for the first time ever for a TWO-DAY clinic hosted by the Diamond Dusters! Find out more here! We're honored to be speaking at the Wisconsin Fastpitch Softball Coaches Association clinic on Sunday, Feb. 21 in Chula Vista, Wis. Find out more here! We're headed back to Milwaukee to kick off 2016 with a ONE-DAY ONLY clinic! We'll be hosting five sessions of skill work on Saturday, Feb. 20. Find out more here! 2015 National Pro Fastpitch Champion and current member of the Chicago Bandits, Emily Allard, is partnering with Lee University to visit Cleveland, TN on Saturday, January 16, 2016. An all-day clinic will be held at The Baseball Mission facility for players 10 and older. To register and pay online, please click here. 2015 National Pro Fastpitch Champion and current member of the Chicago Bandits, Emily Allard, is hosting a clinic in Northbrook, Illinois on Sunday, November 15, 2015 at Diamond Instincts Baseball/Softball Academy. To register and pay online, please click here. 2015 National Pro Fastpitch Champion and current member of the Chicago Bandits, Emily Allard, is heading to Bloomington, Illinois for a clinic on Sunday, October 18, 2015 at Batter Up! Training Center. Register online here! We're headed back to Illinois to kick off the summer with a slapping, speed and fielding clinic! We'll be hosting a FULL day of skill work on Sunday, June 28 at Nicholas Dowden Park (920 Crane Blvd.) in Libertyville, just a short drive from Emily and the Chicago Bandits' home stadium! To register and pay online by credit card, please click here. Are you ready, southern California? Be the Momentum is coming to you for TWO FULL DAYS of slapping, speed and fielding on April 25-26 at Cardiff Sports Park (1661 Lake Dr.) in Encinitas, CA! We're so excited to be making our first trip out to the San Diego area to work with some California speedsters (ages 8-18)! To register and pay online by credit card, please click here. SWEET HOME CHICAGO! Be The Momentum is returning to the Windy City to host a clinic at Play Ball USA Northbrook (1885 Holste Road) in Northbrook, Illinois on Saturday, March 28. We are ecstatic to be heading back to our old stomping grounds to work with some Illinois speedsters (ages 8-18)! To register, please click here! Get ready, Wisconsin! Be the Momentum is coming to YOU for TWO FULL DAYS of slapping, speed and fielding on March 21-22 at the Greenfield Ignitor's Practice Warehouse (2236 South 116th St., West Allis, WI, 53227)! We're so excited to be making our first trip out to Milwaukee to work with some Midwest speedsters! To register, please click here!